Like many dads, Roger Federer is talking with his family about how to spend Christmas. But unlike most, the father-of-four has the 2017 holidays on his mind - on the eve of the tennis season when he will turn 36. It is an age few reach while still on tour. Yet the player who beat Rafael Nadal in three sets to take the Swiss Indoors title on Sunday seemed far from retirement. ''I have a very clear plan how '16 is going to be until December,'' Federer told The Associated Press in an interview after winning his hometown event for a seventh time. ''That is the discussion I'm having with my wife right now. Are we going to be home for Christmas or not? Then '17 is around the corner for me as well already. ''I'm thinking way ahead,'' said the Swiss great. Why wouldn't he? At 34, the numbers for his season speak of a player in top form and fitness. 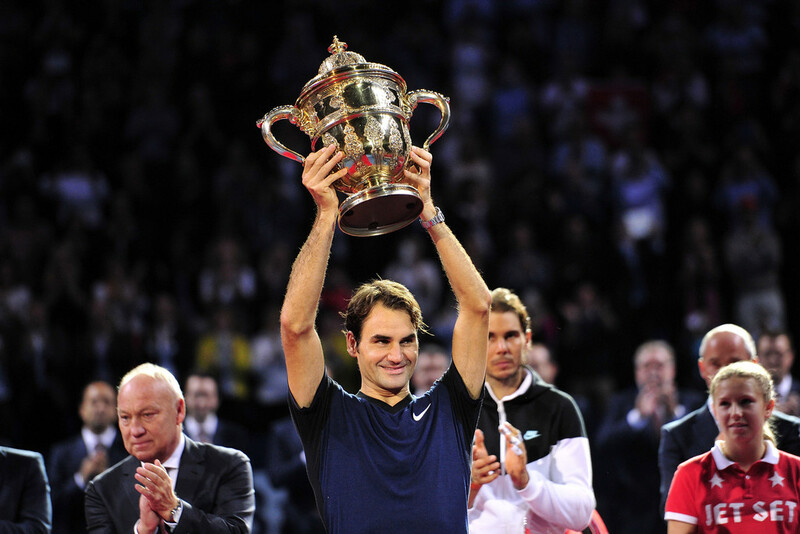 A 58-9 record going into this week's Paris Masters, including six titles and two Grand Slam finals. Only Novak Djokovic in his career-best year has beaten Federer in tournament final, including denying him a record-extending 18th major title at Wimbledon and the U.S. Open. After Paris, Federer goes to London to play at the ATP World Tour Finals for a 14th straight year. Expert managing of his schedule, including a family vacation in September, has kept him sharp when others - including his younger self, he says - are worn down in November. ''That is the goal with having the time off with the kids, with my wife,'' said Federer, whose family - wife Mirka, their 6-year-old twin girls Myla Rose and Charlene Riva, and 18-month-old twin boys Leo and Lenny - often join him on tour. One product of his keen tennis mind is the now-trademark move to sneak up and return serve while approaching the net. ''The sneak attack is a fun thing for me to do,'' he said. ''How many times can you hit a slice and be excited about it? Fun-seeking is also why Federer says he will play into December in the International Premier Tennis League at places like India, Singapore and Dubai, where he has a home. For now, Federer enjoys his tennis too much to think too deeply about stopping. ''As long as I haven't decided what I'm going to do yet, I've got to keep a schedule as well which I feel like I'm playing for many more years to come,'' he said. Federer previously said he will not announce a long-term plan to end his career, so avoiding a farewell tour. ''I hope it's going to come gradually and that I will know when the right time is,'' he said. ''But I don't want to think about it too much. He is sure that, as with his Christmas 2016 plans, parents and family will be part of the retirement conversation.